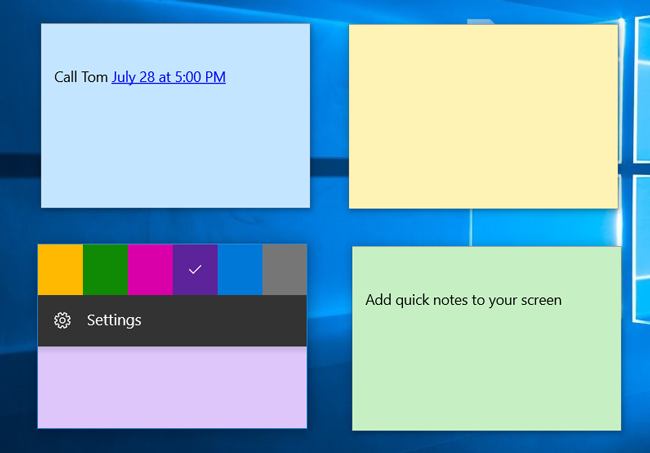 While Microsoft Sticky Notes is great for quick note-taking, it hasn't got many features. 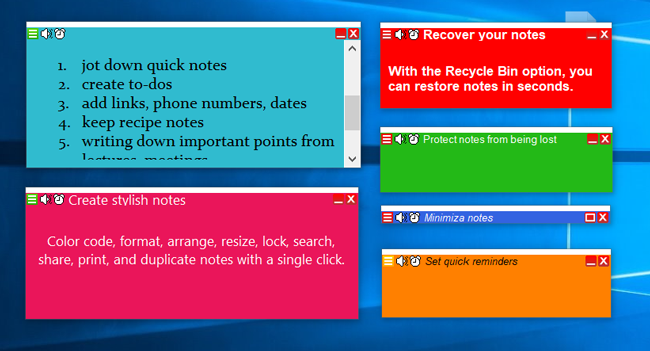 If you need more options, JustNoteIt with deep customization, the Notes Manager and the Recycle Bin options and search capability is a great alternative to Windows Sticky Notes. 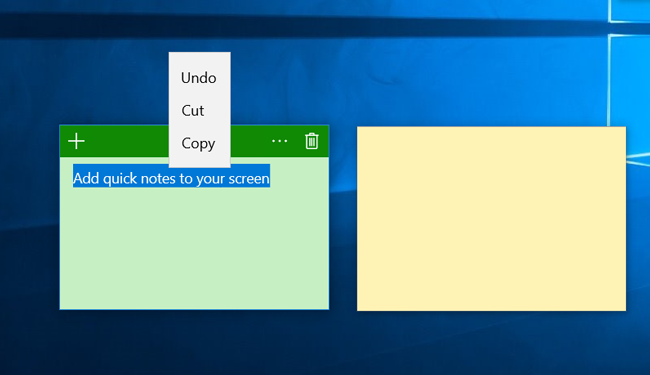 This sticky notes application exists in two versions - JustNoteIt for Windows 10 and JustNoteIt for Windows 7, Windows Vista and Windows XP. 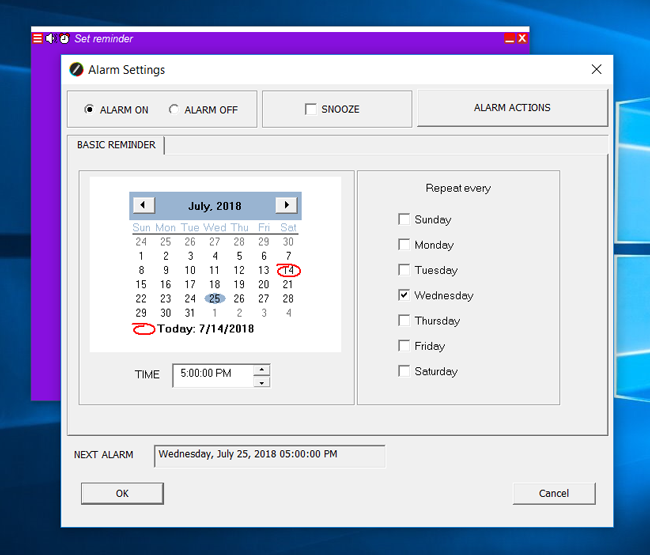 You can download JustNoteIt here. The Sticky Notes app used to be in Windows XP, Windows Vista and Windows 7/8 and it is still in Windows 10. JustNoteIt combines extensive functionality and intuitive and user-friendly design. It is a cute sticky notes app that allows you to capture your ideas. The app supports a variety of great options to organize your notes with ease without making things too complicated. You can customize, format, sort, search, print, duplicate, search and tag your notes in one click. In addition, the app supports a variety of formatting options, including options to bold, italicize and underline text, create bulleted and numbered lists, adjust lines and paragraphs settings and more that allow you to make your sticky notes more stylish. Each sticky note consists of two areas - note's title (or header) and note's body (or text area where you type your text in). You may add a title to each note for further searching and sorting. 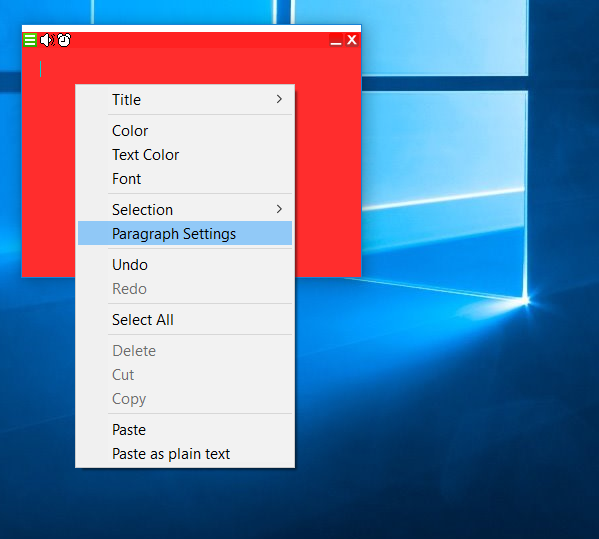 Right-click in any part of a note will open the context menu with the following items Title, Color, Text color, Font, Selection, Paragraph Settings, Undo, Redo, Select All, Delete, Cut, Copy, Paste, Paste as plain text. Clicking on the "_" icon next to the close icon "x" in the upper-right corner will switch note's state between "minimized" and "restored". With the JustNoteIt Notes Manager, you may perform batch operations on notes and efficiently organize them on the desktop - show, hide, minimize and cascade sticky notes and reminders. One more option that helps you organize sticky notes is Note's priority. According to your choice sticky notes may be always visible or may be pinned to the desktop. 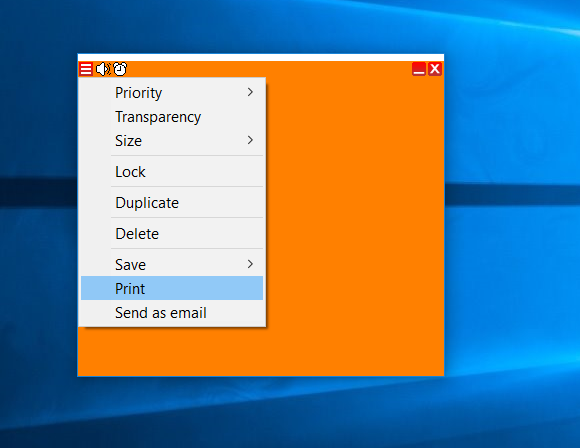 Right-clicking on the icon in the upper-left corner provides quick access to the following options: Priority, Transparency, Size, Lock/Unlock, Duplicate, Delete, Save, Print, and Send as emails. All these actions can be performed on an individual note. The Speaker icon, next to the Note's menu icon, activates another great option - "Note to speech". So the app reads your note's text aloud. The app offers various reminder options to inform you about important dates and events in many different ways. Using this option you will be notified in time even your notes are hidden. Have you ever deleted an important note or file with your daily works or important dates by mistake? Unlike many sticky notes applications, JustNote allows you to move deleted notes to the Recycle bin first, so you can easily recover them if necessary. To create a sticky note, click "+" in the upper-left corner. You can stick notes wherever you want. When you are finished, just click the Delete note icon. 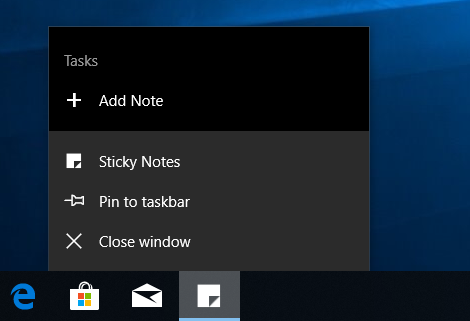 You may easily hide and restore sticky notes by clicking on the Sticky Notes icon in the Taskbar. 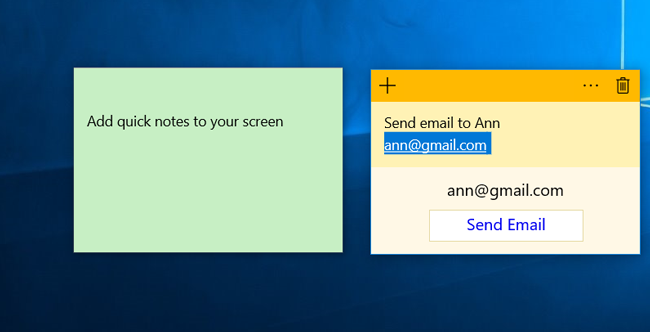 The new version of Windows Sticky Notes brings new interface and some great capabilities. One of the major features is pen input support. Now, the app recognizes your handwriting and you can choose if you would like to type or write using your Surface Pen. Another great feature that's new in Sticky Notes is a handy option to add reminders to your calendar. If your note contains a date and time, you may easily set a quick reminder by tapping on the highlighted text. Thanks email address recognition, you can quickly send emails from notes by tapping the highlighted text. Unfortunately, the latest version of Sticky Notes, unlike the previous ones, does not provide any font settings. It is not possible to change font, font size or font color, line spacing, strikethrough or underline text using hotkeys or copy and paste in other fonts.